Fall is here in it's full glory. Our Maple is beginning to turn. I love watching this tree dress in it's fall colors. I guess that is because there is a fun story behind it. Years ago our youngest daughter, Sara, brought this tree home from school. At that time it was just a stick 10" - 12" tall. We decided to plant it in the front yard of our home. Five or six years later, the tree was between 4' and 5' tall. One noon in July I came home from work for a quick lunch. I found Sara and a group of half a dozen of her friends standing around the tree. As they were visiting they were absentlymindedly stripping every leaf from the tree. There were only a couple of leaves left on the tree and they were stripped off before I could get out of the car to stop them. I figured the tree was a "goner". I was wrong. The next year, the tree leafed out fuller than ever. I guess it thought it had been pruned. Fast forward 15 years. Sara is grown and far away living in Florida. We were in the process of building a new house. One day while visiting with Sara on the phone, she asked if we were taking "her tree" to our new acreage. We hadn't given it any thought but after a short discussion decided it would be a good idea. We hired a guy with the appropriate machine who came out, scooped up the tree, took it to our acreage, and planted it in a prepared hole. We filled 4 or 5 large garbage cans with water, hauled them to the site and watered the plant. That was it. It went in a year before we built. We didn't go to the effort to haul water to it again. The tree was totally on its own. It would have no further help from us. I guess it really wanted to live. Today it is the most beautiful, stately tree in our yard. We are so glad Sara insisted we bring it with us. 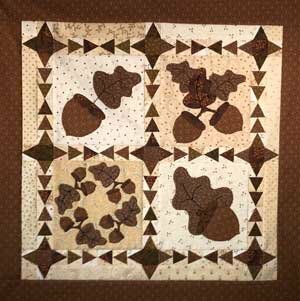 My Next Free BOM - "Connie Sue's Sketchbook"
"Acorns" -6" blocks with "Arrowhead" sashing. Blocks are from "Connie Sue's Sketchbook." 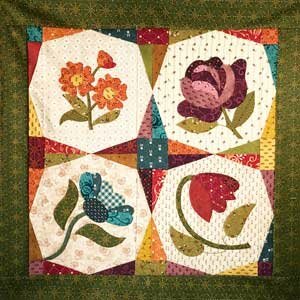 For me it began with the Dear Jane Quilt made by Jane A. Stickle in 1863. When Brenda Papadakis published her book with the Dear Jane blocks my good friend Joan jumped right in. Each month she would bring another completed block or two to club. It was so much fun watching her quilt develop. 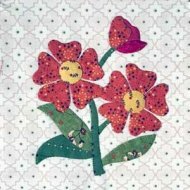 I hadn't started Apple Blossom Quilts yet but I still didn't have time to make this quilt so I lived vicariously through Joan as she made her quilt. I did however buy the book and dreamed of the day I would have the time to start it. I really don't remember the order the quilts presented themselves after that. There was Sylvia's Bridal Sampler (Jennifer Chiaverini). Several good friends started this including Linda and Karen. Loved seeing the blocks as they were completed. Still didn't have time to make it myself but I bought the book. Somewhere in there The Farmer's Wife and The Bible Quilt were authored by ( Laurie Aaron Hird). I bought the books. Do you see a pattern developing? 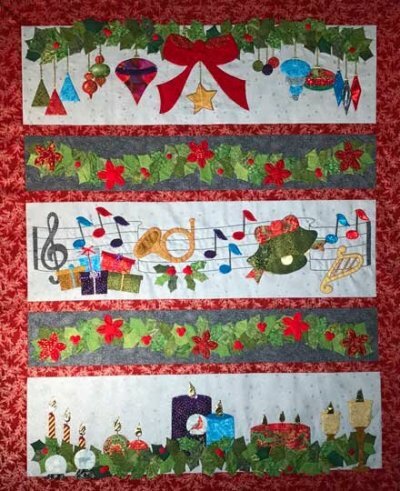 The most recent was Pat Sloan and Jane Davidson's Splendid Sampler - a quilt with blocks designed by 83 different quilt designers. Joan did this one as well. Each month as she shared her most recent blocks I became more and more envious. And I bought the book. I wanted the same experience but couldn't take the time away from my business appliqué. Then it hit me. I could do something similar if I designed the blocks myself. I could use the quilt as a free BOM. 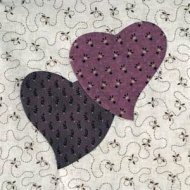 And I could make it unique among 100 block quilts by making every block an appliqué design. I had birthed my next free BOM- "Connie Sue's Sketchbook." Today I have 80 out of 100 blocks designed and 65 are stitched. I have yet to tire of the quilt. That alone is making this quilt unique. The experience is everything I had hoped it would be. "Flowers" - 6" blocks with "Picture Frame" sashing. Blocks are from "Connie Sue's Skektchbook." Having decided to do a 100 - 6" squares block quilt, I next needed to select fabric so I could get started. I was very tempted to make it in batiks. I love batiks and knew I had enough fabric on hand to complete the appliqué. I would only need to buy the background fabric. However, last summer I made a "Row-by-Row" quilt. I took my completed quilt to Wash Tub Quilts in Klemme, Iowa. I was the first to take a completed quilt to this shop and I received 25 fat quarters of Kim Diehl fabric. I decided that would be a great start for my new BOM. However it would be a major shift in color and style for me. Could I pull it off? I made my first block. I was absolutely smitten. The rich colors exceed all expectations. And best of all Kim had made most of the fabric decisions for me. 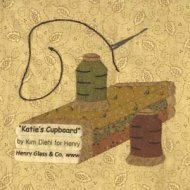 I have since added additional fabrics from other Kim Diehl lines. I have a general rule when selecting fabric for flowers. I like to have at least 5 different shades of the same color for a flower. To achieve this I have had to add a few non-Kim Diehl fabrics to my fabric pallet. I also designed several blocks with snow. I didn't want cream colored snow which I thought would be too much like my background. I decided to go with light gray and turned to reproduction fabrics. 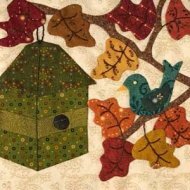 With the addition of a few architectural fabrics such as bark, rocks, basket weave and roofing fabrics, I was ready to appliqué. I'm going to handle this free BOM differently than I have in the past. I'll tell you all about it next month so you will know what to expect when I begin publishing patterns for "Connie Sue's Sketchbook" in January, 2018. I want to thank all of you who have invited me to join your social media. I'm sure you will understand when I explain that I really don't have time. 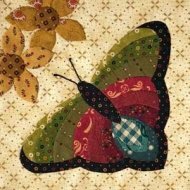 I do try to keep up with my business account on Facebook but beyond that I'm afraid my applique takes up all of my time. Maybe someday when I retire I'll have more time to indulge. But until that day arrives I'm going to keep my nose to the grindstone - the applique grindstone that is. It's a little early to be thinking about 2019 but I wanted to let you know that we have penciled in January, February, and March of 2019 for a trip to California. We don't plan on arriving until after "Road to California" quilt show is over. Sometime after the first of the year I'll start taking bookings for this trip. We will probably start in southern California and work our way north. We expect to go through Oregon and Washington. We are hoping to visit relatives in Surrey, BC on the way home. 2. 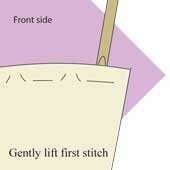 Gently lift the first basting thread out of the background fabric leaving it in place in the applique fabric. 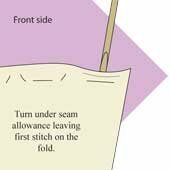 3.Gently turn under the seam allowance leaving the basting thread on the fold. That's it. 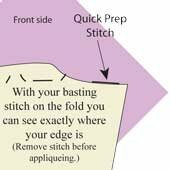 You will know exactly where the edge of your applique is because the basting stitch is on the fold. Remove basting stitch before appliqueing. A Sneak Peek at "Connie Sue's Sketchbook"
Here's a sneak peak at a few of the blocks that will be coming your way in my next free BOM. I'll start off with some easy blocks. I'll gradually increase the difficulty. Along the way we will encounter a few seasonal blocks. 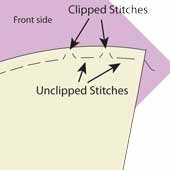 Before you know it you will be stitching intermediate blocks. 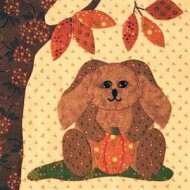 We'll meet several rabbits including "Harvest Bunny." There will also be "Beach Bunny", "Snowball Bunny" and "Sunny Bunny". 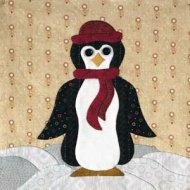 Brightening a corner of our quilt will be "Mr. Penguin" enjoying the snow. With 100 blocks to play with I have been free to let my imagination run wild. 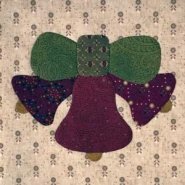 A number of blocks such as "Mr. Penguin" were designed for quilts that never happened. These blocks have now found a home in this quilt. "Fabric, Etc." may be the hardest block I have ever designed but I promise to take you through it step by step. Yes, there will be 4 sewing/quilting blocks. You may want to make a little 4-block quilt from them. 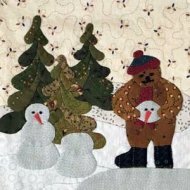 "Building Snowmen" is a block I designed for a calendar quilt. Never completed the quilt but the block has found a home in "Connie Sue's Sketchbook." I'll also introduce a packet of sashing options. 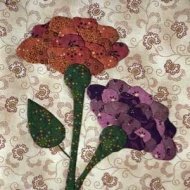 These designs will help you make a sparkling quilt using 1 to 100 blocks. Here it is. The last row of our current free BOM. This row is loaded with candles and snow globes. Click here to download the PDF file for this row. After sewing my rows together, I trimmed the top and bottom red rows to 2 1/2". I then cut 2 - 2 3/4" x height of quilt top for the left and right borders. I am looking forward to quilting it in time to use it during the Christmas holidays. If you have joined us late, I'll include the URL's for the entire quilt. 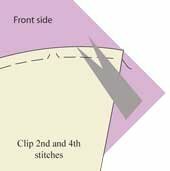 Here are the cut sizes (finished) measurements for the rows. Finished sizes are in parentheses. Cut rows as defined above. Applique 2 rows of holly, 1 row of baubles, 1 lyrical row and 1 row of candles and snow globes. Sew rows together. Add side borders. Quilt as desired. Label quilt top. Click here to download holly row. Click here to download bauble row. Click here to download lyrical row. Click here to download candles/snow globe row.